For my job at the moment, I am roughly spending 50% of my time working on .NET and the other 50% of the time working with Scala. As such a lot of Scala/JVM toys have spiked my interest of late. My latest quest was to try and learn Apache Kafka, well enough that I at least understood the core concepts. I have even read a book or two on Apache Kafka, now, so feel I am at least talking partial sense in this article. So what is Apache Kafka, exactly? Here is what the Apache Kafka folks have to say about their own tool. A single Kafka broker can handle hundreds of megabytes of reads and writes per second from thousands of clients. Messages are persisted on disk and replicated within the cluster to prevent data loss. Each broker can handle terabytes of messages without performance impact. Kafka has a modern cluster-centric design that offers strong durability and fault-tolerance guarantees. Apache Kafka was designed and built by a team of engineers at LinkedIn, where I am sure you will agree they probably had to deal with quite a bit of data. In this article I will talk you through some of the core Apache Kafka concepts, and will also show how to create a Scala Apache Kafka Producer and a Scala Apache Kafka Consumer. I will also sprinkle some RxScala pixie dust on top of the Apache Kafka Consumer code such that the RX operators to be applied to the incoming Apache Kafka messages. So last time I showed you a slightly cut down demo app (well cut down based on the great work done by our friends at Adaptive, where they created the awesome demo : Reactive Trader). The demo app we looked at last time used SignalR + RX. I also promised that there would be a part 2 of that article, where I showed how to do the same sort of thing using NetMQ (the pure c# port of ZeroMQ the extremely popular socket library) + RX. Historically what we would have done to accomodate these requirements was to use sockets and push our own data (usually JSON or XML) down the wire, and then had some quite knarly listeners above that, where each listener would want some slightly different view of the original streaming data. Thing is, time has never stands still in the world of software development, and new things come out all the time, literally every other day a new framework comes along that helps improve what came before it in some way or another. One particular thing, that I think a lot of people actually misunderstood was Reactive Extensions RX, which in fairness has been around a while now. 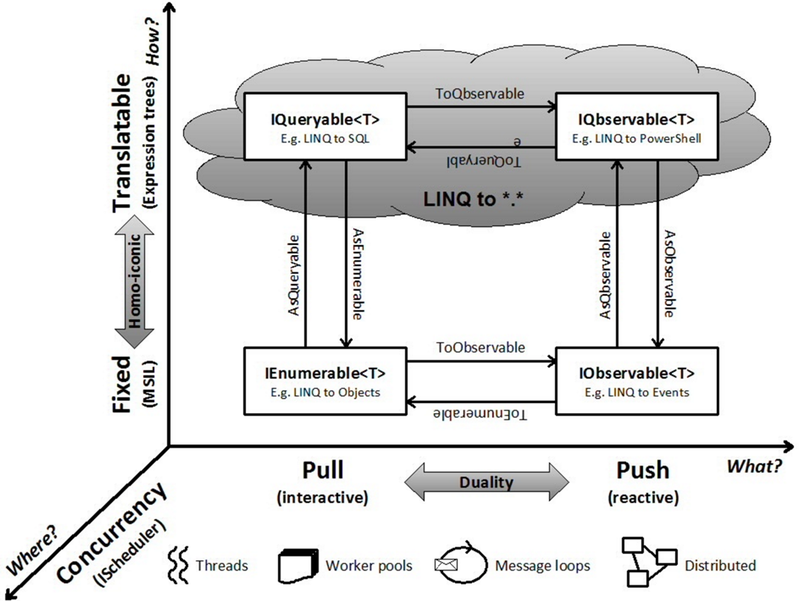 I think a lot of people think of RX as LINQ to events, which it does have. 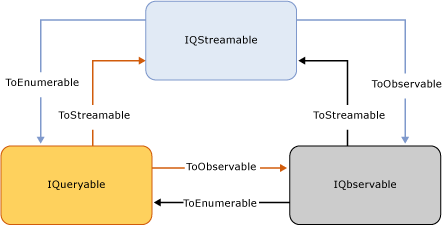 However the truth is that RX is a superb framework for creating streaming applications and the more you get into RX the more you tend to see everything as a stream, from and event, down to picking a file or a ICommand.Execute in a ViewModel say. I personally feel that a lot of people could make use of RX to great gain, if they were to put in the time to learn about it, a bit more. There is also another great library from Microsoft which facilitates push based technology, namely SignalR. Quite a lot has been written about SignalR, but you rarely see that from a desktop point of view. Most people would probably associate a SignalR Hub with a web site, but there are various ways you can use SignalR, which also make it a good choice for desktop (ie non web) development. This is possible thanks to the SignalR OWIN hosting API, such that you can self host a SignalR Hub. There is also a .NET client, we can use to communicate with the hub. 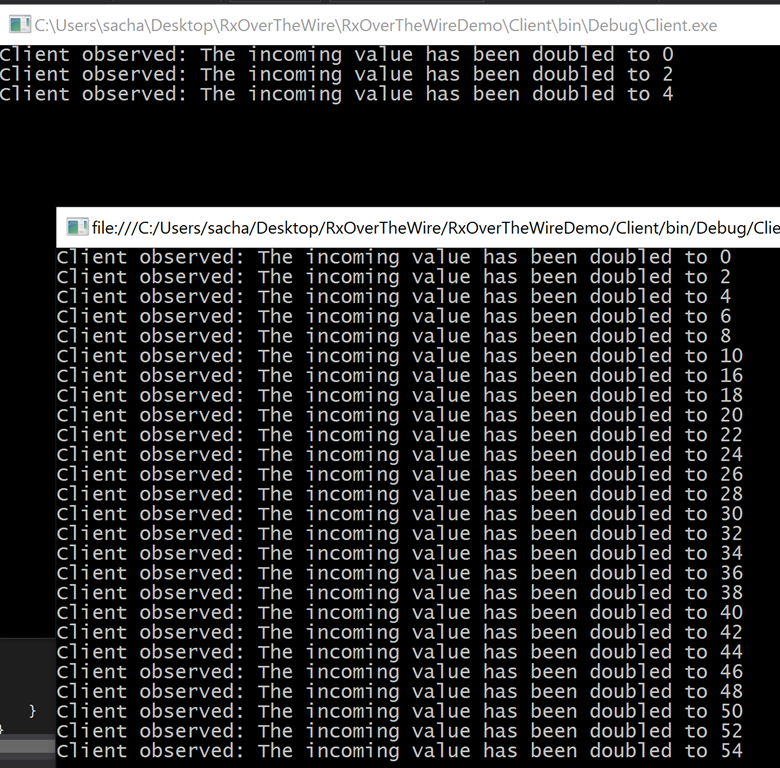 SignalR also has quite a lot of events within the .NET client, and guess what we can do with those events, yep that’s right we can create IObservable(s) streams out of them, which opens up the gates to use RX.